Today, a sunny winter day seems to be a fitting backdrop to a jazzy and loose audience recording of Van Morrison and band from fall of 1974. Featuring a stripped down four piece unit, this recording features Morrison at his (in my humble opinion) most expressive, and spotlights his numerous and amazing musical abilities. This recording is of an unknown lineage and contains moments of heavy chatter and noise, but regardless of these anomolies, the drums pop, the keys are crisp and the vocals come through like a wind chime ring on the cool breeze. The drums do have moments of being slightly muffled, but all in all the stripped down band gives the instruments ample room to breathe. The performance is a superlative and sophisticated collection of songs from a cross section of Morrison's career, played with great care and enthusiasm. I can tell you my dear reader, that this is one of the most enjoyable "Put the Boot's In" that I have composed. I hope you enjoy it too. After an introduction by bass player and stand in MC Jerome Rimson, the band consisting of drummer Peter VanHook, and keyboard player Pete Wingfield groove quietly preparing for Morrison's entrance to the stage. Coinciding with Van's appearance the group breaks into the funky Fender Rhodes infected "Naked In the Jungle", a tune never making an appearance on a official release until The Philospher's Stone CD collection. This recording sounds amazing on headphones, with the ambiance of the venue and sound of the band shining nicely. Quick hitting hi hat exclamations, and Van's groovy motown vocals make this a stellar and rare opener to the evening of music. Without missing a beat the band slides into "Wild Children" off of 1973's "Hard Nose the Highway", with Van laying down dreamy and pointed acoustic guitar licks prior to the vocals. Another bonus of this stripped down band is that Van is the only guitar player, and his musicianship glistens under the steamy stage lights. "Wild Children" rolls like a dusty wheel on an antique automobile, turning over and over in a steady dance with the two track highway. The four instrumentalists join together in delicate note filled pirouettes that touch fingertips, and then spin away, echoing, replying, and sometimes gazing into each others eyes. The crowd is very appreciative during this number, caught in their own introspective minds as Van, with a history stained voice remembers the "war children", and the memories that bind his generation together through his soaring soulful vocals. Pausing briefly, the band then digs into the striding opening guitar strikes of "Bulbs", off of Van's recent LP release Veedon Fleece. Huge applause pours in from the crowd as the band cooks through the song at a slightly more accelerated pace than the original version without sacrificing any of the emotional content. Van's throat a heavenly instrument of flesh, creates it's own tempo's around the rotating groove of the group. His vocal timbre flying like a speeding erratic bird, diving, climbing, and soaring. The accompanying piano gently tip toes across the percussive acoustic guitar strokes like a fire walker. I can honestly say that this version of "Bulbs" is so melodically enriching and chill bump inspirational, that I feel levitated and warmed in a spiritual way. This is essential listening. After the enlightening version of "Bulbs", the crowd can be heard letting out a collective sigh as the recognizable bass line to "Into the Mystic" begins. The tune is loose, slightly funky and perfectly groovy. The great Celtic story teller Morrison is feeding off of the communal vibe that translates from the venue, across the years and to the tape. "Into the Mystic" stretches its legs nicely, but there are longer versions (not necessarily better) that exist on this tour. Van gets the crowd going with his accented and punctuated vocal gymnastics, that dangle of the music in their own tempo and time. The spongy Fender Rhodes squishes softly for the "fog horn" lines, contributing a soaking color. The song reaches a fitting climax with Morrison digging in for the "rock your soul" ending with raspy peaking screams, interacting perfectly with the instrumental swells. Starting as the applause from "Into the Mystic" is still fading to black, "Help Me" shuffles in with a downtown confidence, and bluesy longing. A Sonny Boy Williamson number that Morrison preformed throughout his career with a loving intensity, this version contains Morrison's harp joining with Wingfield's piano out of the verse in a euphoric and awe inspiring tango. Echoing and confirming a voice from the audience that can be heard on the tape replying, "Van is doing everything tonight"! 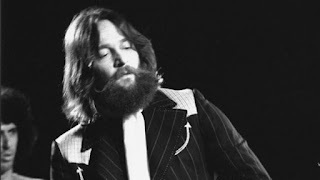 Nestled in a recording full of highlights, the one that shines the brightest is the performance of "Cul de Sac" off of Van's 1974 LP "Veedon Fleece" that follows next. Preformed only two times ever, this version contains a breath taking Morrison saxophone solo and tempo shifting and accentuated Morrison vocals. Van growls, grunts, wines, and soars vocally in much the same way he blows saxophone, fluid, elevated and melodic. The reaction on the recording by the audience tells me that the crowd is aware that they just witnessed something special. One of Van's greatest songs, captured for posterity on this amazing field recording. Without pause the band initiates a pulsing cadence and swings into "Joyous Sound", another song that would not see official release until some years later. Again, Morrison digs deep for some soulful swinging saxophone, and scatting vocals. The band chugs along like a nimble jazz quartet impressively for the short and sweet jazzy interlude. The floating sparse arrangement serves this band lineup well as they can really steer the groove to whatever direction suits them. Morrison keeps the energy up with an earthy rendition of the Ray Charles number "I Believe to My Soul" that sneaks through the venue on a hazy midnight creep. Containing a smokey and slinky groove, Morrison pulls out his saxophone again, for a series of blue notes that joust with the plush keyboard funk that echo his musical sentiments. Morrison dynamically serenades the assembled crowd with creamy smooth lines and gruff sandy growls honoring Charles original version. "I Believe to My Soul" again, with barley a pause pours itself into "Listen to the Lion" seamlessly. Song after song the performance keeps topping itself. 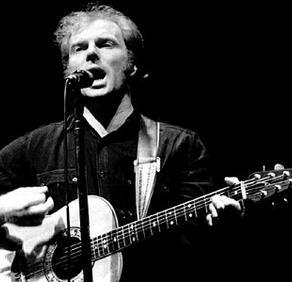 "Listen to the Lion" begins with a rolling acoustic Morrison solo guitar excursion full of original melodic ideas that leave me shaking my head at the wealth of musical statements that Morrison conjures from the atmosphere. This 1974 tour was filled with extended versions of "Listen to the Lion" and this version is probably no different, but unfortunately cuts out at a bit over four minutes. In that four minutes we do get to hear some aggressive and gritty Morrison vocals that aurally feel like sandpaper grinding on a fresh scented slab of wood. I wish there was more of this version available, but so is the world of bootlegs, where we have to be happy with what is available. Where "Listen to the Lion" cuts at the end we are thrown into a "I've Been Working" that is already in progress and join as it speeds along city streets, late for its time clock punch. The band drives a sturdy version at a furious rate containing popping high hat strikes and harp wines that take my breath away. The crowd claps along sprightly with the cooking group pushing them to greater heights. The band eventually fades the song down to silence leaving only Van to introduce "Take Your Hand Out of My Pocket" with several freight train harmonica blasts. Spotlighting the harp and some Otis Spann like rolling piano, the group vamps on some straight Chicago blues showcasing their adept abilities at moving from jazz to blues, to straight rock, no chaser. Following the previous two crowd pleasing smokers, again a master of moods, Van brings the groove to a gentle place as the band twinkles and swirls their way into a stardust bedazzled "It's Not the Twilight Zone". Again, this is a song that would not see release until 1998 and was unfamiliar to the crowd at the time. Van raps his way through the beginning changes of the tune, sharing a intimate dialog with the audience, about late night coffee and smokes. Cozy and plush, brushes and tinkled keys, Van sings in a honey drenched falsetto that elicits yells of appreciation from the crowd. Similar to "Cul de Sac" Van keeps the attention of the crowd with his shifting and emotive vocals that range from slippery woodwind to raspy screaming horn blasts. There are some slight microphone rumbles in the beginning of the song, but nothing to distracting from the dynamic performance. The sound of the recording stays pretty consistent throughout the show with minimal distractions. There is a slight cut/blip during this song, but again it is a minimal deterrent. Once Morrison and the band hit the proper groove, Van starts to free flow, and sing off microphone to the delight of the crowd. The crowd responds in kind, and the back and forth of crowd and performer is a pleasure to behold on the recording. The MC announces, "Van Morrison everybody! ", and the show reaches its conclusion. After the encore break the band returns and immediately shakes their way into "Moondance" making their way through the changes instrumentally prior to the verses. "Moondance" charges forward in a tempo that fluctuates at a faster rate than the studio version, and then slips its way into a temperature raising version of "Fever". Sandwiched by "Moondance" on either side "Fever" is nestled comfortably by the cool moonlight that surrounds it. 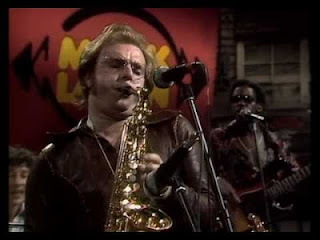 Morrison uses "Fever" to introduce the members of the band, before completing the cycle with a sax interlude, and a slick return to "Moondance". The obvious crowd pleaser and proper show closer, Van and the band shimmy into a "sand in your sandals" sounding version of "Brown Eyed Girl" that brings to mind visions of Jimmy Buffett. "Brown Eyed Girl" bats her eyes longingly and quickly, while she sips a drink by the bronzed steel drums player. The crowd sings and claps along to a celebratory version, bringing to a close a wonderful and diverse set of music. 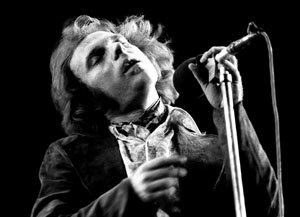 Van Morrison's live act in the fall of 1974 was a loose and minimal affair that in my opinion injected a improvisational and unique groove to Morrison's catalog. His prior 1973 "big" band brought out different aspects of his "soul" side, while this group, I assert, revealed his multiple instrumental talents, with a focus on the "song". Like all great artists Morrison would soon move in another direction, but during this featured era he was writing prolifically, and performing uniquely. I highly recommend digging into the performances available from this time period for a glimpse of unreleased music, instrumental prowess, and towering vocal displays. funny to read all the stories about what a grumpy old man he has become. Still great but not a fun guy.